Day two of our visit to Sipi Falls started with another sunrise chase. Yet again I missed the sun coming over the actual horizon, but it was just as beautiful, if less colourful, when it broke over Mount Elgon literally next to the first of Sipi’s falls. There was an obligatory morning selfie to prove that we all survived the night. Sunlight had not changed overnight. It was still very bright. Though it moved quickly (we were short on time because our driver was needed in Entebbe), the tour was excellent. Juliet, the guide, told us the coffee plants take ages to grow and don’t get very large. There was a 30-year old tree nearby where we sat that was less than double my height. The plants fruit after heavy rain, and are picked soon thereafter. The flowers begin white, turning to beans that change from green to yellow and finally red when they are ripe. Three stages of coffee beans. Once picked, the bean has three “covers” (shells). The first is removed by a machine, the next is pounded in a mortar. The beans themselves are surprisingly resilient and survive this process in flawless condition. Every one of us had a go at smashing the beans’ second layer off. Elyce joins the bean-pounding fun. I pound a few beans. Husked beans, husks still on the plate. More husk removal, proving how well she flips beans. Rachel works out her frustration on the poor unsuspecting beans. Arwen joins the bean-grinding fun. We all enjoyed the bean-grinding, but only Simon was truly good at it. …and then the most important part happened. Juliet made us coffee. I drank a cup and a half because one of my companions couldn’t finish hers. I was momentarily tempted to take some artsy photos of the coffee. I chose to enjoy it instead of feeding my inner tourist. It was a bit smokey in the hut. Boiling water and coffee bean mixture. I broke into tourist mode to get a shot of us with Juliet. My inner tourist also photographed notice boards at Crow’s Nest in case any of you want to play tourist there and need an idea of what is available. Simon, Elyce, Arwen, Juliet, and Yours Truly. Elyce, Arwen, Juliet, and Rachel. Notice board at Crow’s Nest. The other notice board at Crow’s Nest. The drive home was on the same terrible roads, but in reverse, meaning they improved as we got closer to Jinja. I turned to music instead of photographs. The tourist was gone, satisfied until the next trip. 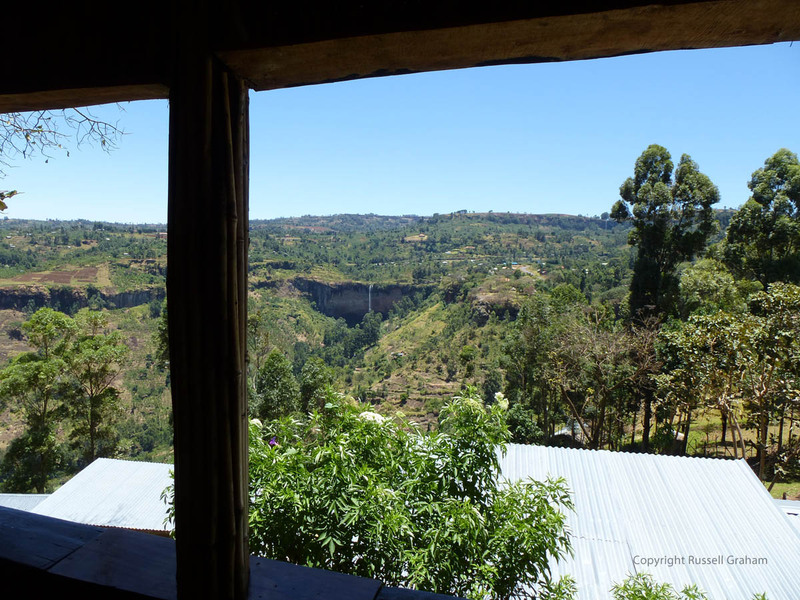 Nestled on a plateau of Mount Elgon about 6500 metres above sea level, the town of Sipi could be just another sleepy mountain town. A dozen hostels and guesthouses along less than two kilometres of road told a different story. A man shouting “Sipi falls, this way!” as our van passed him confirmed the hypothesis – this is a tourist town. Entering Iganga, early in the journey. Iganga is the first large town after Jinja. Entering Mbale, the last town before Sipi. I wish I had got out of the vehicle to stick my arm into one of these potholes. Elbow. Deep. Climbing Mount Elgon, looking over the plains where we had come from. We were well shaken when we arrived, having traveled for five hours on roads that were under construction or filled with elbow-deep potholes. We stayed at a hostel named Crows Nest. Built on a slope facing all three falls, two of which were visible, every guest house and dorm had a view worth being jostled by the road. Their food was basic but filling, tasty, and inexpensive. I would recommend Crow’s Nest to anyone. The view from our hostel dorm. Well worth the trip, even without tours. Simon, a local tour guide, led us on a trek to see each of the three falls. The first gave me an impromptu shower. Tall boulders surround its pool, holding in spray and making the air damp like a cool sauna. There was also a chameleon called Joseph. Dang chameleon eyes are weird. The first falls from where I wasn’t afraid my camera would get soaked by spray. Chameleon! His name was Joseph. Joseph and some white dude from Canada. On our way to the top of the second falls. The second falls make a natural shower, as well as a beautiful view from the top. I asked a co-traveler to take epic photos of me looking over the Ugandan plains. Co-travelers Rachel, Arwen, and Elyce. The view from the top of the second falls, unspoiled by my presence. Flower! It was pretty, so I took a photo. Walking to the bottom of the second falls. Behind the falls. Natural shower is on the right. Behind the falls, slight different angle, arguably better lighting. The third we could only see from a distance. It also offered a brilliant view, which I used to take numerous group selfies wherein sunlight wouldn’t let us fully open our eyes. The final falls. I think you can see some small black dots near its top – those are people. Plains as far as the eye can see. Those are controlled burns, by the way. Bro-selfie of Richard and me. Arwen and Rachel looking over the epic view. Squinty group selfie including our guide, Simon. Squinty selfie with the final falls. On return to Crow’s nest, we ordered dinner. Tomato curry was a good idea even though it was more like a spiced tomato sauce. We walked to watch the sun set into pillowy purple clouds, still far above the horizon line. I’ve no photos of that – I left my phone and camera in our dorm, choosing to lay down my tourist hat and be present for a Ugandan sunset. My stomach growls. I stand less than fifty metres from the Nile river, just North of the Nalubale/Owen falls hydroelectric dam, making a mental note to my future-self that one piece of bread with a thin layer of peanut butter does not count as breakfast. I’m not yawning yet, but less than four hours’ sleep is telling my eyelids to stay shut. The air feels like late spring back home: cool and wet, yet comfortable in a t-shirt and shorts. I see a half dozen wooden boats near the dam. Moses, a coworker and friend from Arise and Shine Uganda who lives on the land where we stand, explains they are fishing for talapia. 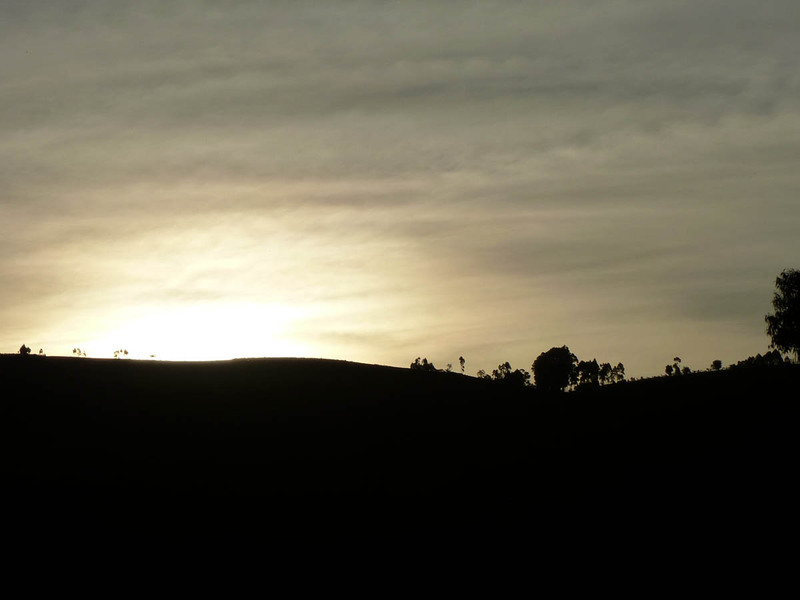 Sunlight appears on a hill many kilometres away on the opposite side of the river. The clouds are bright pink that slowly swallows on purple remnants of twilight. I flick my camera’s power switch and wait to line up the right shot. The sun hadn’t quite cleared the horizon yet. Some cute chicks I met. A cute chick I managed to pick up. After the sun had risen and tea had been consumed. Uganda votes for their president on February 18th: It is election crunch time. Posters advertising candidates are everywhere, and the men (sadly only men) themselves are making their rounds. Dr. Kizza Besigye, opposition leader and strongest candidate next to incumbent Yoweri Museveni, visited Jinja and area today. The rally blocked both lanes of Jinja’s two-lane and two-direction main street for half an hour or more, its seething mass moving toward the center of town. It began elsewhere in the city in the morning and then toured through the area surrounding Jinja. Music blared from boulder-sized speakers mounted on trucks. Men and women clung to the sides, tops, and rears of vehicles using anything they could hold on to, dancing and shrieking with envious joy. Boda boda (motorcycle taxi) riders and passengers were so dust-coated their skin had turned the orange-red of Ugandan soil. I felt nervous watching, but smiled in spite of myself. Such enthusiasm and excitement were infectious, though there was no need to be close (I really have no part to play in the election), so I observed from a safe distance. I did not see Dr. Besigye in the procession. Doxycycline is a daily antimalarial prophylaxis. In fewer syllables: it helps prevent malaria. It is my third line of defense after killing every mosquito I meet and mosquito nets. It has a multitude of other uses. For example, my skin will be clear of acne, and there is almost no chance I will be harmed by anthrax nor the bubonic plague. Regardless of its other uses, I use it to prevent malaria, so I’m glad it exists and I am happy take a daily dose. Worth noting, however, is that it must be taken after eating a reasonable meal. “A good bed of food” was the description given by my local coordinator. …which I learned after I found out what ‘doxy’ looks like on the inside of a toilet bowl. …which takes on a greater purpose in the global South. Malaria-bearing mosquitoes are a known quantity here. Fatal if not treated quickly and correctly, malaria is as scary as any other tropical disease and more insidious because of its unassuming transmission medium. As awful as the disease itself is, antimalarial treatment alone is worth avoiding. Many people familiar with “quinine” will attest to psychotic side effects. Let’s go back to netting, but stop momentarily to talk about doors. It is an accepted fact that doors must be closed to be effective. You could drive a bus of mosquitoes through that door. 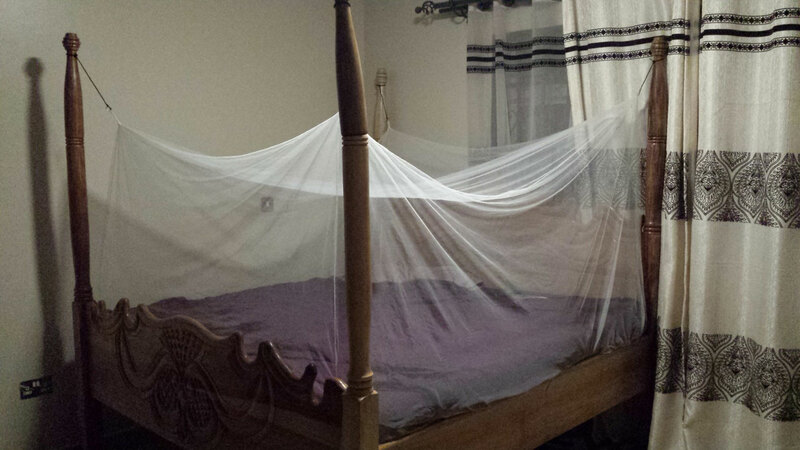 A mosquito net must be tucked under the mattress to be effective. 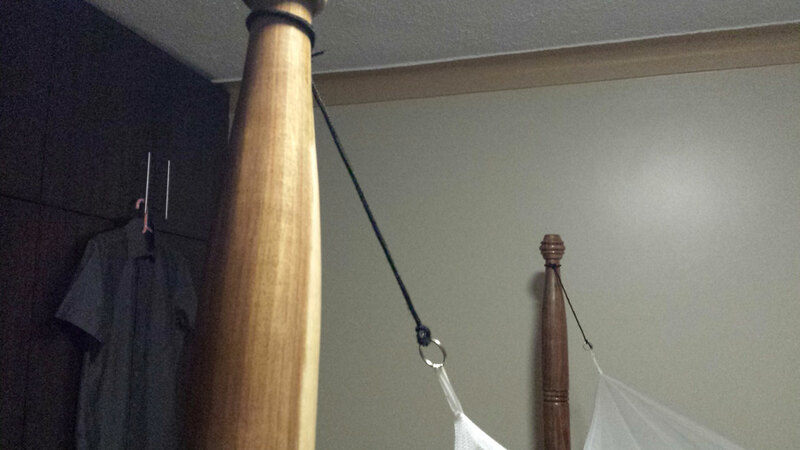 In this case, the bed’s posts are too far apart to tuck netting under the mattress (thus my original problem). Few, if any, nets of that size would be available. My first thought was to hang it from the ceiling. That would require purchasing an eyelet to screw into the ceiling. My Scottish blood went pale and clutched its metaphorical wallet. Screws in the bedposts were also out of the question, since my collection of saved and leftover screws, a testament to frugal advice from my Dutch opa, was back in Canada. I knew my heritage would eventually cave to self-preservation. However, after a long night spent trying (unsuccessfully) to kill a single mosquito inside the net, staring at the bedposts like a lazy lion might watch for prey to walk within claw’s reach, I reached a conclusion. I was asked by a friend to award one thing in Uganda as the “most surreal thing I had experienced so far”. The drive to Kampala was overwhelming. I stared out the window wide-eyed like a baby handed to a person they don’t recognize. We were on a highway, but it was like no highway I knew. Road rules were incomprehensible. Right-of-way seemed to be decided by arcane rules and communication that I couldn’t see or imagine. Buildings occupied almost every linear metre of roadside. Short, squat microbusiness centres, each with at least a half dozen kiosk-sized stores. Three-storey concrete slabs in varying states of completion and repair, some windowless and others palatial. Roughshod sheet metal and wood shacks that sold everything from cellular airtime to “hotel”. There were no concrete dividers anywhere on this highway. Micro-busses the size of a 1960’s Volkswagen van crammed in more than a dozen people, and motorcycles loaded with impossible cargo darted between and around other vehicles. Both were ever-present, frequently pulling over and crossing lanes to deposit or take on passengers. Vinyl-wrapped steel sentinels loomed above the wheeled chaos. These billboards seemed a hundred metres tall, brandishing posters advertising the incumbent president Yoweri Museveni, brand name carbonated brown sugar water, and cell phone networks. Nothing was clarified or comprehensible in Kampala. Intersections seemed to mean, “slow down and force your way in”. There were no crosswalks. We stayed long enough to buy cell phones, eat a late lunch, and deliver a pair of other interns to a hostel. Darkness coated the highway to Jinja. There were no streetlights. Some of the arcane communication between vehicles became clear. High beam headlights and turn signals spoke a language, but still not one I could understand. By then I could hardly stay awake. Nightfall, jet lag, and thousands of inexplicable sights consumed every memory of loading into what would be my home for the next six months. Bed was a mother’s embrace, cradling a child burst out crying in a stranger’s arms. 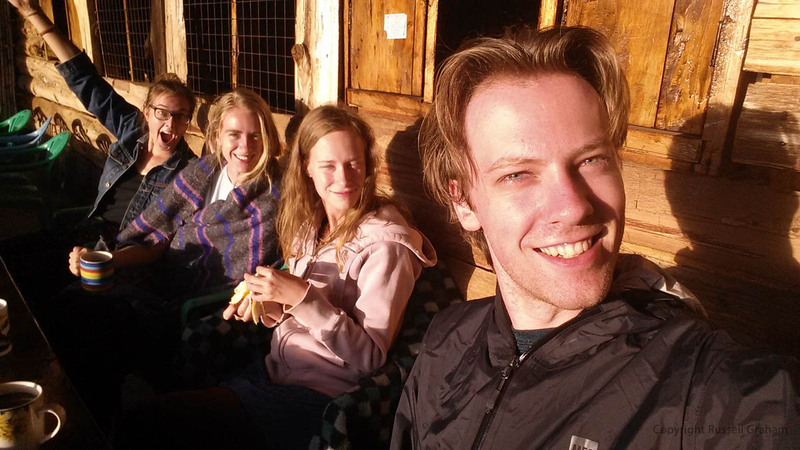 Living in Uganda for six months seems pretty simple until the middle of a 13-hour flight from Toronto to Addis Ababa. Shortly after “The Martian” ended (neat movie, by the way), reality came screaming in as fast the aluminum cigar tube carrying me and three of my fellow IYIP interns. Six months away from the home I’ve known for twenty-four years. Friends, family, and every creature comfort are now across an ocean on a continent thousands of kilometres away. My heart lurched at the thought, pounding hard like the engine of an overloaded cargo freighter. An entire life is behind me in a trail of jet exhaust. I thought for a moment about how easy life at home would be. But then, I would not have an opportunity to fly across the Atlantic Ocean. Or see the sun rise over the eastern edge of Africa (sorry, no pictures). Or live and work for six months in a city on the edge of Lake Victoria, mere kilometres from the source of the Nile river. Life would be “business as usual”, and there is nothing wrong with a big helping of the unusual.